Revelers come from far and wide to enjoy the sights, sounds and shopping of the season in The Junction. West Seattle Junction will be full of the holiday spirit with four weeks of jubilant festivities for our neighborhood and visitors alike. Please join us throughout the month of December! Want an evening shopping alternative to stuffy malls? Many Junction retailers are open ‘till 9pm on Thursdays. Pair with happy hour and you’ve got a great night out! Santa is coming to Junction Plaza Park to listen to your children’s Christmas requests, and The Junction Association suggests a donation of $15 or more that will go directly to WestSide Baby. Santa’s Workshop also includes free art activities brought by the neighborhood. 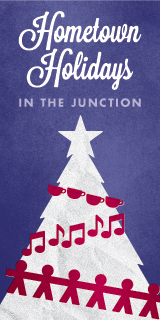 The Junction presents our 10th Annual Tree Lighting Event. It’s a community event for family, friends and neighbors. It will be held in Junction Plaza Park at 42nd and Alaska. Take a walk on the wild side and find a truly unique gift! Explore art exhibits and trunk shows hosted by Junction businesses. Take a traditional carriage ride down California Ave pulled by beautiful Belgium Draft Mules. A treat the whole family and friends will enjoy. Santa will be awaiting your child’s visit at City Mouse Store. Drop in for a hug and a smile. Bring your camera and capture your own special moment. (4218 SW Alaska). In the spirit of the holidays, and as a thank you to our community, The Junction will give away dozens of prizes to our valued customers. 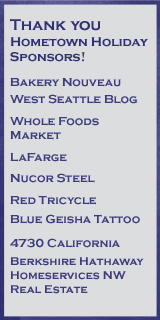 Live Local, shop The Junction and you could win a holiday shopping spree!